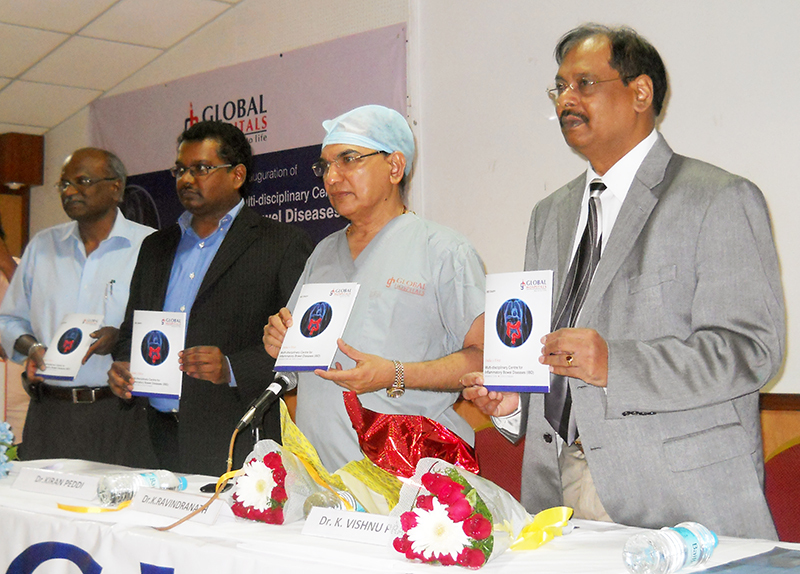 6 March 2013: Global Hospitals, India’s leading multi-super speciality tertiary care chain of Hospitals, today at Lakdi ka pul, Hyderabad launches India’s first Multi-disciplinary Centre for Inflammatory Bowel Diseases (IBD). Dr. K. Vishnu Prasad, Director of Medical Education, Government of Andhra Pradesh inaugurated the Centre in the presence of Dr. K. Ravindranath, CMD, Global Hospitals Group and the multi-disciplinary IBD team comprising of Dr. Kiran Kumar Peddi, Medical Gastroenterologist, Dr. Kishore V Alapati, Surgical Gastroenterologist and others. IBD should be suspected in anyone suffering from unexplained diarrhea, bloody diarrhea, abdominal pain, weight loss, recurrent intestinal obstruction and recurrent perianal fistulas. Children usually present with failure to grow. Less commonly, patients demonstrate extra intestinal symptoms of IBD such as back pain, eye symptoms, painful skin lesions. All these patients should be evaluated thoroughly and appropriate treatment should be initiated early. Late diagnosis and improper management can lead to severe intestinal and extra-intestinal complications and impair quality of life. 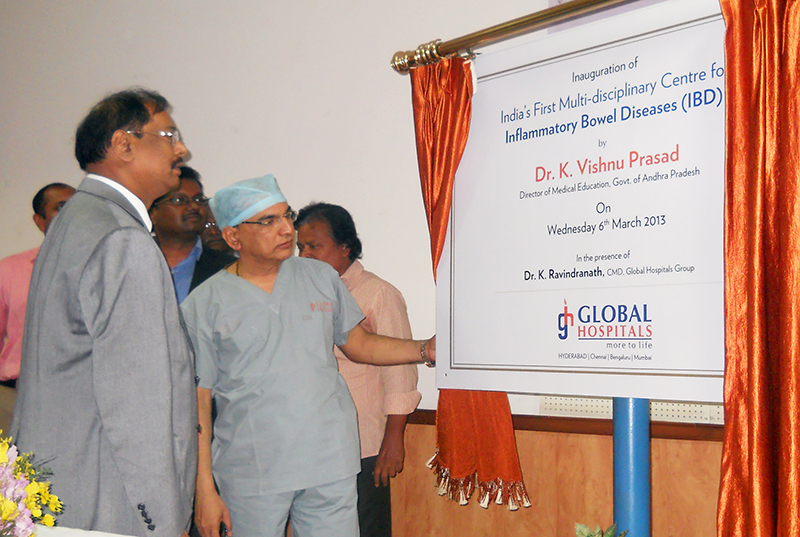 Global Hospitals, being at the forefront of many novel health care services, have taken an initiative to launch Multidisciplinary center for IBD, for the first time in India. A dedicated team of Medical and Surgical Gastroenterologists with extensive work experience from IBD centers across the globe will lead this service and will be supported by other specialists such as Radiologists, Pathologists, Molecular biologists, IBD nurse and dietitians. A dedicated clinic will be started and all the suitable patients will be enrolled into IBD pathway with help of a “Patient Diary” which comprises many protocols suitable for IBD patients such as looking after their vaccinations, screening for complications, looking after their bone health, anaemia and many more. This comprehensive pathway will be extremely beneficial for suitable patients in looking after their IBD, managing the disease effectively and preventing any complications. Speaking on the occasion, Dr. K Ravindranath said, “The incidence of Inflammatory Bowel Diseases (IBD) which includes Ulcerative Colitis and Crohn’s disease, a decade ago were thought to be extremely rare in countries like India, but it is on a steep increase in the Indian masses and is leading to health complications as timely diagnosis and treatment is not delivered. To address this growing concern, the dedicated centre comprised of Specialists from across disciplines will deliver comprehensive diagnostic and treatment solutions for IBD”.